Rediff – The Pakistan wicketkeeper-batsman could be in hot water with both the PCB and International Cricket Council if he failed to report such approaches. The Pakistan wicketkeeper-batsman could be in hot water with both the PCB and International Cricket Council if he failed to report such approaches. IMAGE: Kamran Akmal told a local channel that he had been offered $200,000 to “leave two balls alone” in a World Cup match against India in 2015. 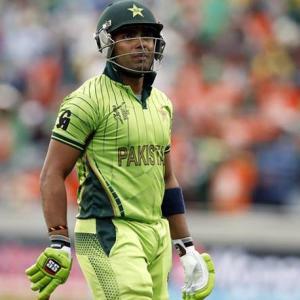 The Pakistan Cricket Board (PCB) is to seek an explanation from wicketkeeper Umar Akmal after he said in a television interview that he had been approached to fix matches. The PCB’s anti-corruption unit has scheduled a hearing for Wednesday after Akmal, who has made 116 ODI appearances, told a local channel that he had been offered $200,000 to “leave two balls alone” in a World Cup match against India in 2015. The 28-year-old also said he regularly received offers to fix games against India and that he had always rejected them, but he could be in hot water with both the PCB and International Cricket Council if he failed to report such approaches.